Throughout the project CORKLANDTOUR. Cork, Landscape & Tourism. An Appreciation of the Corklands, an assessment of their potential to the tourist industry, which receives the assistance of the Biodiversity Foundation and the Ministries of Agriculture, Food and Environment of Spain, you will discover the world of cork area by area, the open countryside where museums and visitor centers can be found. To promote the local development of cork-producing territories and create awareness about the importance and uniqueness of its natural and cultural heritage through tourist revitalisation. 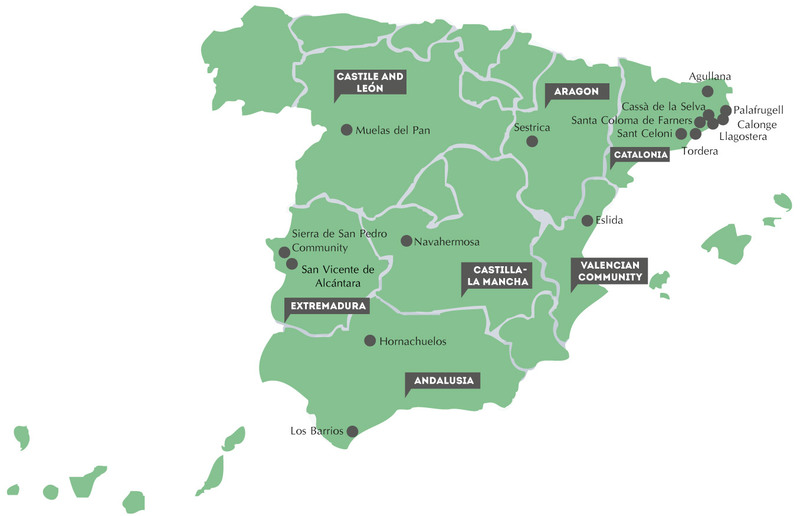 Through revitalising landscapes and cork-producing heritage, the aim is to create an extensive range of nature, active, cultural, wine and gastronomy and industrial tourist products aimed at different niches of the national market and the main European markets from which tourists come to Spain. This tourist activity should create new opportunities for economic development in rural areas that are compatible and complementary with maintaining the primary (forestry) and secondary (cork transformation) activities as a basis for the sustainable development of the territories. The project will be developed during 2014 in cork-producing territories in Andalusia, Aragon, Castilla-La Mancha, Castilla and León, Catalonia, the Valencia Region and Extremadura that are members of RETECORK. To update the inventories of tourist resources in cork-producing territories and their presence on the commercial platforms done by RETECORK in 2011. Courses: creating awareness and training tourist agents from the cork-producing territories on creating products. Adaptation, translation and dissemination of a best practices manual for creating tourist products. Presentation of cork-themed products, nationally and internationally. Communication and promotion campaign on the unique character of cork-producing territories and the associated tourist offer. Presentation to tour operators, the mass media, opinion makers, the local population and possible visitors through the participation at events in different formats and the development of a technological platform. CORKLANDTOUR aims to reinforce the work done by RETECORK, intensifying the relationship between micro and small enterprises, tourist agents (both public and private) and possible visitors, to revitalise cork products and their associated heritage. The creation of themed products will also enable the diversification of visitors, will reduce the seasonal nature of visits, creating new jobs (more stable and better quality) and will improve the profitability of the tourist activity.